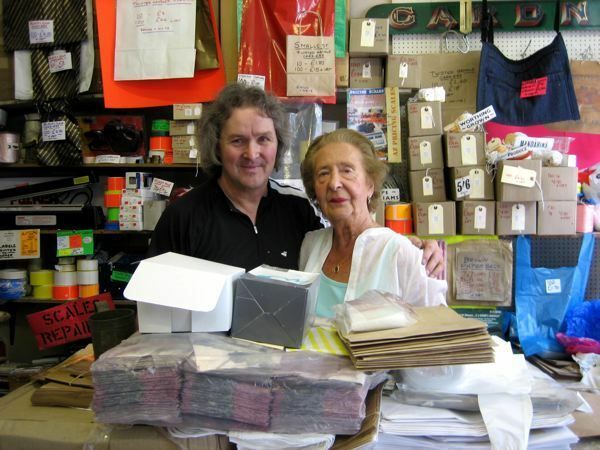 Between the ages of twelve and fourteen years old, Joan Rose regularly visited Gardner’s Market Sundriesmen (established 1870) in Commercial St to collect orders of paper bags from Bertie Gardner for her grandfather Alfred Raymond, proprietor of Raymond’s greengrocers (founded 1900) in Calvert Avenue next to Arnold Circus, where Leila’s Shop is today. 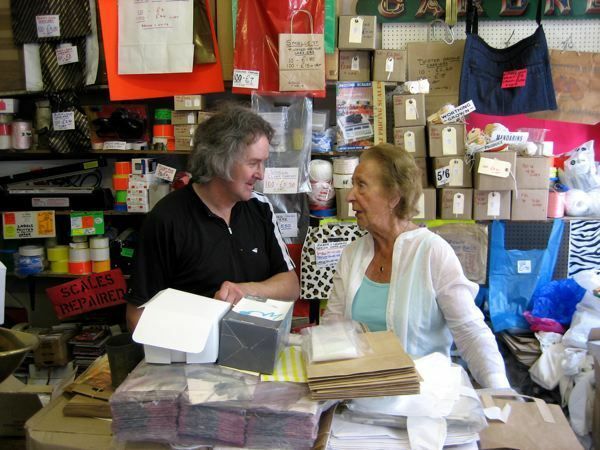 Joan, now eighty four, has not been back to Gardners since she was evacuated from London at fourteen years old, so yesterday I took her along to meet Bertie’s grandson, Paul Gardner, who runs the shop today – a fourth generation paper bag seller and the owner of Spitalfields’ oldest family business. Paul never met his grandfather Bertie, but Joan remembers him clearly, always wearing his brown dustcoat. “He didn’t talk down to you. Even though I was twelve years old, he’d say ‘Can I help you?’” recalled Joan, appreciative of the respect that Bertie, whom she knew as Mr Gardner, paid to her as a young woman over seventy years ago. Once I made the introductions, Joan and Paul began their conversation by discussing bags. “Would you mind going over to Gardners, we’re short of 2lb bags?” Joan announced gleefully, quoting a commonplace line of her grandfather’s, to outline the premise of her visits to Commercial St, so long ago. “I think we had bags printed here?” queried Joan, as Paul indicated a dusty old brown paper carrier with images of fruit printed upon it, as a example, while he and Joan exchanged a nod of joyful recognition. “They were much wider in those days, weren’t they?” she commented to Paul, who directed her to the contemporary equivalent hanging on the opposite wall that is taller – with a grin, revealing that a certain professional rapport had been cemented between them. 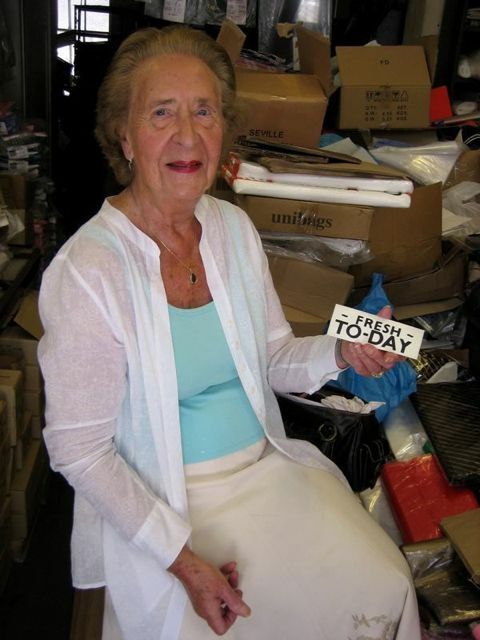 Surrounded on all sides by packets of paper bags, Joan sat herself down upon a stack, gazing around her with a child’s delight at this spectacle from her youth, as Paul served a stream of customers coming in for bags. Joan was fascinated by the familiar brass scales with a large scoop that stands on Paul’s counter, and the old weights with iron loop handles that sit upon shelves behind the counter. “When a bomb landed on Calvert Avenue, a fourteen pound weight like that blew off the shelf and hit my grandfather in the head and nearly killed him,” she informed me, widening her eyes in amazement at the wonder of his survival. Once the flurry of customers had departed, Paul produced two of his ancient account books with entries for “Raymond” to show Joan. One was in the eighteen nineties, when Paul’s great-grandfather, James, serviced the scales for a Mr Raymond in Quaker St. “One of my grandfather’s brothers I think,” explained Joan, “they were all costermongers.” The other entry was for a Mr Raymond in Dalston Lane in 1920, who was slow to clear his account. The page was annotated with the phrases,“Reminder sent” then “Stiff letter,” before payment was eventually received by cheque in 1923. Joan was dubious about this entry, because her grandfather never wrote cheques, he always gave her an envelope of cash to pay for the bags, which may account for the lack of surviving paperwork. With regret, she dismissed this unreliable character from Dalston Lane as another of her grandfather’s brothers. Joan recounted to Paul how Bertie Gardner occasionally walked into her grandfather’s shop to make deliveries in person, with the cursory, “Alf, here’s your bags!” – a cue for Alfred to search through the wooden block of wood with scoops in it where he kept his change. Hearing this story was the cue for Paul, the grandson, to bring out the block of wood with scoops out of it that has served four generations of his family to store coins. The merest sight of it was a delight for Joan. “But he never kept notes in it!” she retorted, wagging her finger in amused qualification, a comment that was itself another cue for Paul. This time, with a mischievous smile, he brought out an old Oxo tin and then a Fuller’s Cake tin, that he uses to keep his bank notes in today, causing Joan to clasp her hands in rapture. Then, with a natural sense of theatre, Joan opened her handbag and produced a photograph of Raymond’s greengrocers taken in the nineteen thirties and, sure enough, there were the bunches of brown paper bags that came from Gardners. As more customers arrived in Paul’s shop, they also became party to this impromptu display, sharing expressions of wonder at these images, and amazed to meet a returned customer in the shop from more than seventy years ago. For a moment the haste of the day was stilled. It was a timely reminder of the unique quality of Gardner’s, a remarkable and much loved establishment, where the smallest traders of East London go to buy their bags today, as they have done for over a century. Even though he has a vast number of loyal customers who rely upon him, Paul Gardner only earns £250 a week, yet his landlord’s agents Tarn & Tarn are seeking to raise Paul’s rent from £15,000 in a single step to £25,000 per annum, next month – a single act that could drive Gardners out of business, destroying an invaluable East End family institution. Joan was outraged to hear this news, “We’ll have to start a petition!” she declared, animated with righteous anger. 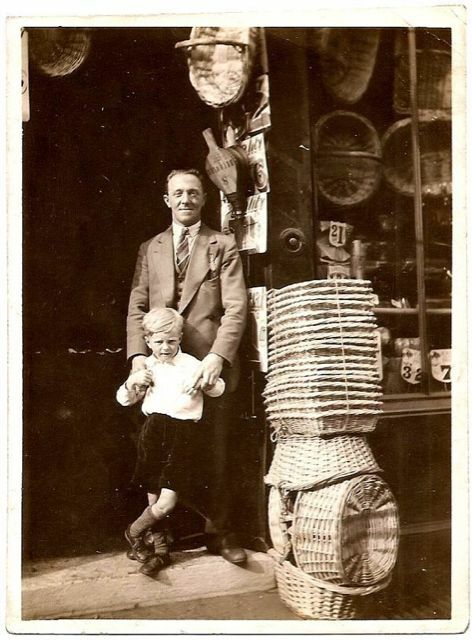 Paul’s grandfather Bertie and father Roy outside the shop in Commercial St around 1930. 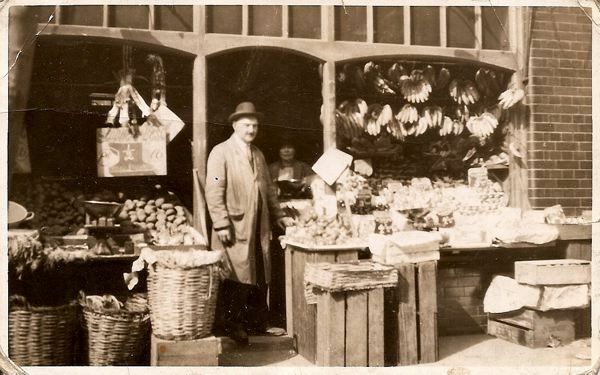 Joan’s grandfather Alfred Raymond outside the shop in Calvert Avenue around 1930. 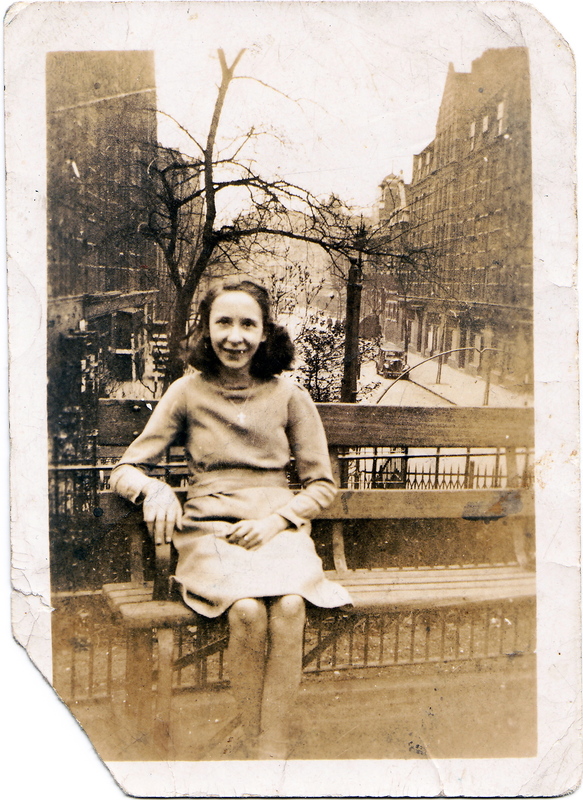 Joan sitting in Arnold Circus in 1940. Every one was so happy in those days, I worked for the co-op in the mid 50s and I can remember all those different size bags they where much thicker in those days, I use to pack up 1lb bags of sugar they where in dark blue bags and you folded in the top very carefully. Utterly delightful. Lovely story, lovely writing.